1. Porridge. I am dreading Summertime when it's too hot to have this delicious breakfast. Sebastian made me the best Princess Porridge in all the land yesterday. It had a perfect helping of blossom honey in it but it also had gold edible glitter and golden stars sprinkled onto it. It was so pretty. This morning I had honey and mixed chopped nuts. Yum. 2. Girls. This TV show is great. I know I am late to the party with this one but I prefer to be sometimes. It happened with Gossip Girl too. So whilst it's being tweeted about I have no idea what they're talking about and years later I decide to watch it it's like I have discovered this amazing new show and no spoilers. I have downloaded Girls on the Sky box and I can watch a whole series in one day... until Sebastian wants the Playstation. 3. Black. I have stolen a giant Black tee from Sebastian's drawer and I love it. For some reason I don't own many black pieces and I am starting to love the non-colour. I need more black in my wardrobe. I might pay H&Ms men department a visit tomorrow to make a few purchases. Oh and that way Sebastian gets his tee back. 4. Change. Sebastian ordered a new TV cabinet from Ikea and I'm in love. We have moved the lounge around and it feels so good. We have much more space and it looks like a new room! The plan is to sell alot of things and just have a mass clear out of the whole house. It's surprising how much stuff we have accumulated over the four years we have been here. 5. Rain. I finally got to wear my perfect yellow rain mac this week. It was great... though my boots aren't the greatest of quality when it comes to heavy rain- I had a soggy sock by the time I had gotten to work. Oh at least my top half was perfectly dry! That yellow looks great on you. I've been looking for a yellow raincoat for ages and this one is lovely. Love that raincoat! Oh and that porridge? Need it in my life!! I really need to start watching Girls, I've heard such good things but it has completely passed me by! Hehe this dedication to the cause of porridge made me chuckle. And made me want to make more exciting porridge!! The rain jacket is perfect! love the bright yellow shade. Good luck on selling the pieces you don't need from home! That jacket is amazing! I love anything yellow, I need something like this is in my life. I love how your posts are just full of nice everyday things which cheer you up. I still haven't gotten around to watching Girls (I'm being cheap and hoping it will eventually end up on Netflix or Amazon Instant Prime for free) but I must admit I read Not that Kind of Girl recently and I really didn't like it... so now I'm not sure about Girls either! I have a lovely yellow raincoat from Cornish brand Seasalt that has gorgeous wooden toggles and engraved buttons. It does make me look a bit like a 5 year-old or Paddington Bear but I think that's also the appeal! 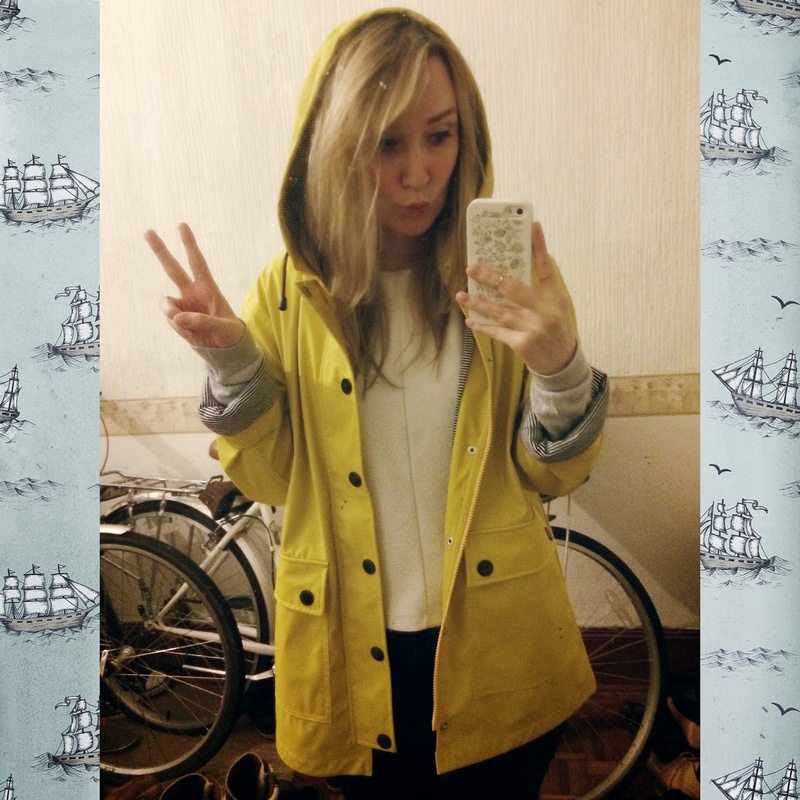 The yellow rain mac is just perfect! Do you ride a bike?